Sugar (sucrose) is a carbohydrate that occurs naturally in every fruit and vegetable. It is the major product of photosynthesis, the process by which plants transform the sun’s energy into food. Sugar occurs in greatest quantities in sugar cane and sugarbeets from which it is separated for commercial use. 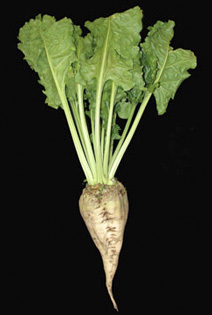 What is a Sugar Beet? A biennial, sugarbeets are harvested annually for their roots. The source of one third of the world’s sugar, sugarbeets are considered to be one of the newest commercial crops. Starting in the late 18th century, German scientists began to breed beets to increase the sugar content of their roots from 1–4 percent to 15–20 percent. The resulting beet root is narrow in shape with a white root. Sugarbeets are grown commercially throughout the world in cooler, temperate climates. The main producers around the world are Canada, France, Germany, Poland, Russia, Ukraine, and the United States. Commonly confused with red beets, sugarbeets have a white root and are not edible when harvested. More than one-half of the sugar produced in the United States comes from sugarbeets. Annually, more than 25 million tons of sugarbeets are produced on over 1.5 million acres, yielding approximately 20 tons of beets per acre and 4 million tons of refined sugar. There are 30 beetsugar processing factories in the U.S., all located in or near producing areas due to the deterioration of sugar content after the beets are harvested. When sugar beets are processed into sugar, the entire beet is used. After sugar and molasses are extracted from the beet, the remaining pulp is processed into a nutritious cattle feed. Where are Sugar Beets Found? Sugarbeets flourish in temperate climates where the soil is rich and the growing season is about five months long. Farms can be found in California, Colorado, Idaho, Michigan, Minnesota, Montana, Nebraska, North Dakota, Ohio, Oregon, Texas, Washington, and Wyoming. The cossettes are gently lifted from the bottom to the top of the diffuser as hot water washes over them absorbing the sugar. After the sugar-laden raw juice is drawn off, the beet pulp is left behind. This pulp is processed separately into pellets for livestock feed and other products. The juice is then filtered, leaving a golden light brown clarified thin juice. This juice is boiled under vacuum where much of the water is evaporated, forming a thicker juice similar to pancake syrup. After a second filtration to ensure that all non-sugar materials are removed, the juice goes to the boiling pans. Once again the juice is boiled under vacuum and crystals begin to form. 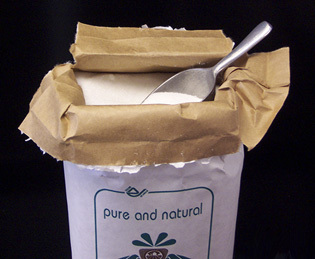 The resulting sugar crystal and syrup mix is called massecuite. The massecuite is then sent to centrifuges for separation. By spinning rapidly in a perforated cylindrical basket, the syrup is thrown off through the screen holes. Clean hot water is used to wash the sugar, producing pure white sugar crystals. The damp crystals are dried with filtered air in a rotating drum granulator, and the dried sugar passes over screens which separate the various sizes of sugar crystals. The products are then packaged and shipped to grocery stores and food manufacturers.